Mr. Scarrow's books of Macro and Cato have been a love of mine for a while now; currently my favorite historical fiction series overall (I'm sorry Mr. Sharpe). The character development and stories have been interesting. I've also enjoyed seeing young Cato mature (though slightly disappointed that Mr. Scarrow hasn't paid the same attention to Macro).Praetorian has Cato and Macro now in the Praetorian Guard, working for Narcissus to expose a plot against the Emperor. Rather than being a nice simple affair, Mr. Scarrow has our heroes learn the underside of Roman politics and why it's sometimes safer to be on the frontier than in Rome. Mr. Scarrow does give us our fight scenes but there's more description of Cato and Macro uncovering plots and surviving adventures than the military maneuvers of earlier books (yes, I miss the simple days when Cato was an Optio, Macro was the Centurion, and we were interested in how their century would survive the fight. While this is a departure from the normal for Cato and Macro, it really just rolls them back from the big scheme to a smaller unit view. An enjoyable read, solid 4 stars for me! One to add to the endless list of Roman "mystery" novels.Relatively little time is spent on familiarising readers with the two main characters. It's arguable that that was because this is over a dozen books into the series so the author didn't feel it necessary. To me however it feels a little lazy as it could have easily been worked into being a book that stood out on its own instead of being just a link in the chain.As far as the storyline goes, there isn't much in the way of suspense, intrigue or menace. The conspiracy is there but it feels very much like it's on the back burner and doesn't particularly get your brain ticking over.There's far too much pondering, wistful thinking into the distance and ruminating. Far too little action or menace for my liking.The only thing that saves this book is that mercifully, in the last quarter of the book, the pace and intrigue actually kicks in at last and makes up for lost time. If you don't see the second conspiracy coming, then you should be registered a literary blind person.Overall not the most riveting, darkest or compelling novel surrounding a conspiracy but an alright addition to the canon. I enjoyed the foray into the political arena of Rome for this installment in the Cato/Macro adventures. Just finished the 11th book in Simon Scarrow’s Eagle series detailing the lives of two Roman soldiers, Macro and Cato. In the first book, Under the Eagle, Marco was a Centurion and Cato a new Optio (similar to a second lieutenant in today’s Army) that was to be his second-in-command. Now, in The Praetorian, after a series of adventures in Gaul, Britain, Israel, and Egypt in the preceding novels, Cato has advanced in rank to outrank his former boss. They have become useful to Narcissus, a freed slave who has become a trusted advisor to Emperor Claudius, who, in this historical fiction novel, brings them to Rome to act as spies by transferring them to the Praetorian Guard—the emperor’s own guard. Members of the guard are apparently conspiring to murder Claudius and elevate his adopted son, Nero, to the throne. Although not thrilled at having to be spies rather than soldiers, they accept the duty. The novel is a departure from the usual military campaigns that Scarrow details so well, but is equally entertaining with insights into life in Rome. When grain deliveries to Rome fail, the emperor must throw more and more elaborate circuses to placate the mob—conditions that the plotters hope will help them seize power. Sound like an American political campaign today? Anyway, a great read and fitting new story about Macro and Cato. Five Stars easily. 4 StarsDoes exactly what it says on the tin! A good continuation in the series for all fans of Macro & Cato out there.I must admit to prefer the duo when they are soldiering rather than acting as Imperial agents for Narcissus but with the yarn set in Rome it revolved around the Praetorian guard, the Imperial family, the plebs & was a decent enough mystery & adventure story with enough about it to be learning about the machinations of the Guard & the politicking of the court of the period. You might think that by the time you reach the 11th book of a series that features the same two protagonists that one might get tired of those two protagonists. Not so with Cato and Macro. They continue to entertain, this time from Rome itself as they go undercover in the Praetorian Guard. The story is full of the normal give and take between them as they sniff out a plot to assassinate Claudius. Twists and turns in the plot keep the story moving. Indeed, the author has done a magnificent job as he leads the reader from the opulence of the palace to the stews of slum ridden streets and even into the great sewer system itself. If you are a follower of this series then you will be pleased with number 11; it is a page turning delight. Fantástico. Intriga, conspiração.. o 11º volume da saga da Águia não desilude. Depois das grandes batalhas em Creta, Síria e Egipto, foi bom ter agora um capítulo num ambiente mais urbano, no coração de Roma. É um livro que "desromantiza" a Guarda Pretoriana, revelando um mundo onde apenas os interesses pessoais imperam e não o bem comum. É um livro onde a acção fervilha em cada página, revelando-se difícil de largar. Apesar de ser o 11º livro da saga, não existe grande necessidade de ler os restantes 10 para se perceber todo o plot, pois o autor enquadra tudo muito bem. É fácil relacionarmos-nos com os dois personagens centrais. São carismáticos e criam empatia, sem serem "super-homens"
This was a bit of a departure from Scarrow's usual writing since it revolved around Roman politics and the role of the Praetorian guard. Overall I enjoyed reading this book. Although, the series does seem to be dragging out a little. Another brilliant instalment and I thoroughly enjoyed every page (screen really as I read it on my kindle and phone). A different setting to the other books but there is still the recurring theme in that they end up to their necks in sewage at some point. Can't wait for the next book. I can readily identify with Emperor Claudius, with his stutter and his gait in contrast to his sharp intellect (he studied Etruscan centuries afer the language died). His public works, such as the new harbour at Ostia, made him popular, though he was once attacked by a mob during a grain riot. Scarrow takes his Suetonius and runs with it. The Eagles can't disappoint (the band neither) and going on an undercover mission in Imperial Rome is a nice change of scenery from frontier warfare in Britannia Egypt. Still, Marco & Cato are soldiers, not spies. They don't do much until they stumble upon the Big Conspiracy, whereupon the end of the novel rushes in with swords drawn. The setting of the ancient city is definitely underused. Brilliant nail biting actionDue to an error this being starred as a four star when it should be a five star. My bad! However you are in for five star action. This is one of the best I prefer the stories where Cato's brains match Macros' fighting skills. Set in Rome with Imperial intrigue and assassination conspiracies for our boys to sort out. And they do. Plenty of fights, lots of gore, imagine it in the cinema. WOW! Read and enjoy Sorry Simon I didn't hit the final star properly. I will be more careful to give you your proper due with next eagerly anticipated one. Al principio extrañé el cambio de las campañas y batallas por las intrigas palaciegas, pero Scarrow hace tan amenos sus relatos que nuevamente logró interesarme por algunos aspectos que desconocía.Creo que si se hiciera leer estos libros (por lo menos el primero) en el colegio a los niños se ganaría mucho en dos aspectos, fomentar la lectura (son amenos) y reforzar la historia (abunda la información que uno suele desconocer). With a suitable gap in time having passed since reading another in the Eagle series, I read and enjoyed Praetorian. It was set in Rome where Cato and Macro were given the task to infiltrate the Praetorian Guard and to foil an assassination plot on Emperor Claudius. This was vintage Simon Scarrow and gave excellent background descriptions of life in Rome of both the common people and the privileged. The story progressed nicely at a pace and is a "must read" for those who like historical fiction with plenty of action and intrigue. I have no hesitation in recommending It and giving it 4 stars. Having read the previous ten books in this series - in a row. I was really pleased with this latest instalment involving Macro and Cato. Less battles and fighting this time round and more plotting and scheming which made for a refreshing change. Not the usual Cato and Macro adventure among the legions, but still a very entertaining story, displaying perfectly the backstabbing politics in Ancient Rome. 11th in the series and a welcome return to the intrigues of Rome – this time with Marco and Cato in the City itself. Narcissus orders them to join the Praetorian Guard as rankers under false names to investigate an apparent conspiracy of the Liberators. Rome is suffering from a grain shortage (partly linked to the previous stories such as the problems in Egypt) and the Liberators appear to be cornering what grain remains using stolen Imperial silver supplies. The setting of the book in Rome with real historical characters mean it is much stronger than many of the previous books. "Praetorian" is het elfde boek uit de reeks over de Romeinse legionairs Macro en Cato. Ik ontdekte de reeks in 2013 toen het eerste boek in het Nederlands werd vertaald (Onder de adelaar) en was meteen verkocht. Simon Scarrow slaagt er fantastisch in om het dagelijkse leven van een legioensoldaat weer te geven en vooral de hardheid en discipline van dat bestaan. Bovendien geeft hij elk boek een interessante historische setting mee, met uitstekend beschreven militaire clashes en een heel spannend "inside verhaal". Eén nadeel voor de fans van de reeks in het Nederlands: de vertalingen verschijnen heel traag (a rato van één vertaling per jaar) waardoor ik naar de Engelse versie ben overgeschakeld (reeds 14 boeken). Wat "Praetorian" zelf betreft, het verhaal speelt zich in Rome af, waar Macro en Cato "undercover" ( dwz. zonder graad, als gewone legionair) worden ingelijfd bij de Praetoriaanse Garde van keizer Claudius. Ze moeten op zoek gaan naar een samenzwering binnen de garde die het gemunt heeft op het leven van de keizer en komen daarbij in een echt wespennest van intriges terecht in de keizerlijke hofhouding. "Wespennest" is dan nog misschien zacht uitgedrukt! Verschillende fracties ijveren binnen de paleismuren om de gunst van de keizer en zijn familie en blijken bovendien allemaal hun eigen politieke agenda te hebben. Het boek is een beetje een "vreemde eend in de bijt" voor de kenners van de reeks omdat hier het "detective genre" de overhand neemt. Maar ook nu slaagt Simon Scarrow er weer probleemloos in om je als lezer aan het boek gekluisterd te houden en hangt hij tevens een heel duidelijk beeld op van hoe de Praetoriaanse Garde erin slaagt om zich in de loop van de tijd om te buigen tot een politiek instrument, zonder wiens goedkeuring geen enkele keizer nog in het zadel kan blijven, een vaststelling die hij op het einde van het boek in een kort historisch overzicht verduidelijkt. Als extraatje is er nog een interview met de schrijver over aspecten van zijn schrijverschap. Ik verheug me al op het volgende boek waarin Macro en Cato terugkeren naar de legioenen in Brittannïe. This is still a great series. In the back notes, Simon, the author talks of returning to two old friends, and that is how the series is now. Macro has softened a bit, though still rough and tumble and a better fighter than Cato. Cato is still the brains that keeps Macro away from the trouble he is prone to get into. Here is the closest we have been to the Imperial Purple, Claudius, who is near the end of his tenure. And we see the seedy underside of politics as all prepare for what is to come when Claudius is gone. It is a shame that we do not see the craftiness of Derek Jacoby in the time when Claudius appears. That would have elevated the story I think.Also, there are times when we can see what Cato needs to see two, and three times before he realizes that there is not one simple plot to follow, but many and, well it's complicated. As Imperial politics should be where all are scrambling for power to come.Yet that complexity and the background make this a great read. Though still troubling is that Cato, so close to his lover, would not send some form of communication to her. A subplot we have been exploring for the previous three books.One hopes that having met Vespasian at the beginning of the series our two heroes will continue on for the next reign and the turmoil and then be on hand to aid that Emperor when he comes to power. Many more tales, please! Shifting from his usual style of writing, Simon Scarrow diversifies the Eagle series brilliantly, introducing a new and interesting change from the usual war accounts. After Cato and Macro return from their grueling "hunt" after the Gladiator, Ajax, they expect to receive promotions, amongst other things, for their achievements. Yet Narcissus, the Imperial Secretary, has other plans for them. 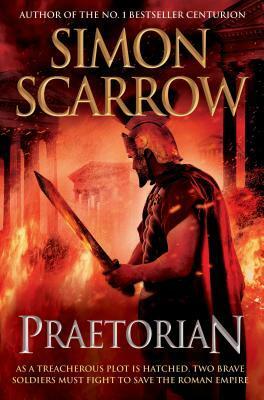 In a time of turmoil and social unrest, the Emperor needs all the allies he can get.Picking up from the last few books, Scarrow finally utilizes the fact that Rome's grain supply is quickly diminishing. The mob is on the brink of starvation, and some mysterious group has hurriedly bought up the extra supply of food. Narcissus believes it's a conspiracy in the Praetorian Guard, the very entity that brought Emperor Claudius to power. Hiring Cato and Macro to infiltrate the Guard and uncover the conspiracy, he hopes to keep his "dear" Emperor in power, and in turn, maintain his as well.Away from the usual scene of battle and gory warfare, Cato and Macro seem out of place with this whole spy business, but will Cato's quick wit and Macro's sturdy soldiering enable them to survive the ordeal? Will they find out the traitors and stop them in time? Read the book and find out! Praetorian sees a departure from the usual legionary capers for Macro and Cato as the two intrepid heroes return to Rome to work undercover as members of the Praetorian guard as they try to uncover a plot to undermine the Emperor, Claudius and bring his reign to an end.Being a big fan of all Mr Scarrow's books, I was really looking to this story especially as it was going to be different. Although enjoyable, the pace of the storyline was a lot slower than usual and I thought there was less humour and cutting remarks especially by Macro that usually have me chuckling away to myself.The picture created by the writing easily allows you to 'see' the environment where the two spies find themselves especially during their escapades in Rome's sewer system. There is also an unusual attempt on the Emperor's life but I won't spoil it for you in-case you intend to read the book.Overall it's another good story and addition to the previous books and best of all, the boy's are returning to the legions and Britannia in the next instalment. En esta novela se ha consumado el giro que han sufrido las novelas de esta saga. En su inicio nos encontrábamos con unas tramas más simples y centradas en las batallas entre las legiones y los bárbaros que no se dejan invadir, pero conforme Cato ha cogido protagonismo las historias han evolucionado hacia unas tramas más complejas y con menos acción. Las conspiraciones se han convertido en el núcleo de las historias y dejan poco espacio para el uso de los puños.En principio esta evolución me gusta y además se ha dado casi de forma natural, dicho lo cual he de reconocer que me apetece que la próxima novela de la saga vuelva a sus orígenes, que queréis que otra diga ;-) a veces necesitamos nuestro chute de droga dura, y además poco a poco Macro ha perdido protagonismo y creó que es una lástima. I like Simon Scarrow. His books are an easy read, mixing a little bit of history with some great action. It's not a literary prize winner - but then it doesn't pretend to be. What I liked about Praetorian is the back and forth of the two main characters (Macro and Cato). There is a chemistry there that jumps off the page. It makes them feel real. Scarrow himself says that they have taken on a life of their own and write themselves. Also, the book has some interesting plot twists - and does keep you guessing (although you won't have to guess too hard). This book differs a little from the others in that this is not a battlefield romp, but a spy novel that sees the two characters go undercover in the Praetorian legion.A fun read, and a good addition to the series that chronicles the exploits of Macro and Cato. For me this was the best of the whole series so far. Scarrow is writing in a different style here as it ends up in a more political conspiracy thriller area, with the solving of the mystery putting this one a lot closer to the likes of Steven Saylor's Roma Sub Rosa series.Due to this it feels much more mature and takes the story of Cato and Macro up a notch. Especially as opposed to the previous The Legion where it almost felt like a teen book in places. Nonetheless Scarrow has somehow cunningly written in a nice handful of skirmishes (although there are no pitched battles) into the story, so you won't miss out on the action. So in that sense it's a win-win.I thoroughly enjoyed the book and I hope the series continues at some point! The story of Macro and Cato is set in the context of Rome in her glory days. There are many relevant themes highlighted such as the blessing of a true friendship in the snake pit where all the snakes are vying for in the dangerous game of politics. The story shows that Rome which is built on the ideal of freedom loses its true ideals when tyranny of the Caesars reign. The book shows that true friendship gives you a purpose in life and success gained through hard work is more enjoyable than success through power plays and politics. Macro and Cato can be related to by any of us as there is a bit of us in each one of us. A good read and a well researched book. Cato and Macro return to Rome in this book and as the title suggests, they are pushed into the ranks of the Praetorian guard to help uncover a plot aimed at taking down the Emperor. As usual, Simon Scarrow delivers with a great story that engages the reader straight from the first chapter. Macro and Cato will continue to be my most favourite ever Roman Legionaries and I hope he never stops writing about these two me. Those that know the series will not be disappointed, those that do not, get involved. Hard, gritty and often humorous in places, this series of books is one of the best for anybody looking for stories in the time of the Roman Empire. Eagle series can be divided into two sets. One has our heroes involved in fighting, other in covert work. This book falls into latter category.Cato and Macro have to go undercover in Praetorian Guard to uncover plot to assassinate eperor Claudius, guided by ever present Narcissus. For our heroes this is somehat of a shock as they are used to their rank but now assume identities of ordinary legionaires.In the process they meet several people who will shape Roman empire later, such as Nero.While book is not bad I prefer books where Cato and MAcro are involved in conventional fighting and life or ordinary legions. Simon Scarrow - Simon Scarrow is a UK-based author, born in Nigeria, and now living in Norfolk. He completed a master's degree at the University of East Anglia, and, after working at the Inland Revenue, went into teaching as a lecturer at City College, Norwich.He is best known for his "Eagle" series. This is Roman empire military fiction, starting with the second invasion of Britain, and continuing with subsequent adventures in every corner of the empire. The stories are told through the eyes of two centurions, Macro and Cato.To date there are fourteen books in the series.